CD’en indeholder foruden Sommasvit (1957) af Axel Borup-Jørgensen en række nyskrevne værker – 4 blokfløjtekoncerter til Michala Petri af Bent Sørensen, Sunleif Rasmussen, Mogens Christensen og Thomas Clausen samt Music for Strings af Pelle Gudmundsen-Holmgreen. De nye værker er alle bestilt af Edition Borup-Jørgensen (Elisabet Selin) som en hyldest til Axel Borup-Jørgensen. Værkerne blev uropført på Lousiana af Michala Petri, Laplands Kammerorkester og dirigenten Clemens Schuldt – for i ugen efter at blive indspillet i Finland. Mogens Christensen’s Nordic Summer Scherzo has the descant instrument in a wealth of deft and capricious exchanges … provocative and diverting in equal measure. It is work full of colour and varied intensity with high harmonics and often bird like effects. I would love to see a score … this is a fascinating CD and would make some want to hear more music by the composers represented. Mogens Christensen begins with what sound like bird calls but uses them to derive material for development as the piece moves on. As the orchestra is based in Rovaniemi, in Finnish Lapland, Christensen has slipped in a small internal tribute to Sibelius (whose 150th birthday anniversary it is in 2015) … This is first-rate music, and first-rate music-making … This recording is recommended for its fine playing and its attractive program. It goes on my Want List. Nordic Summer Scherzo by Mogens Christensen is similar in its nature painting, although slightly warmer. Here, the composer’s use of the high-pitched descant recorder allows for the effective imitation of birdcalls, while his string writing is notable for pizzicato effects and the use of extreme high and low registers. The recorder’s closing high note has to be heard to be believed. This is my favorite among these short but arresting works. 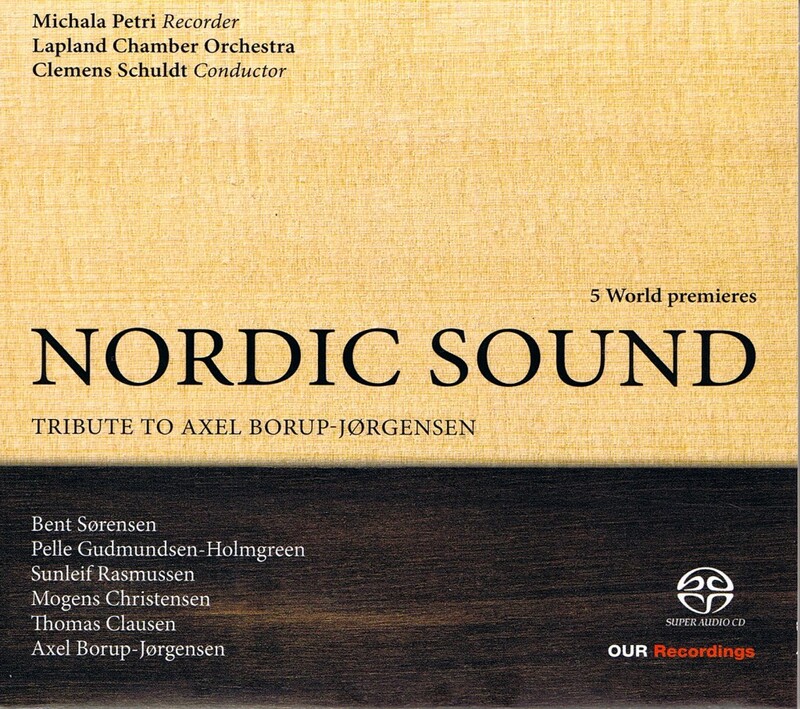 Nordic Summer Scherzo by Mogens Christensen, who takes some notes from piano pieces by Borup-Jørgensen, integrating them into a piece that is inspired by Swedish culture and that country’s ‘midnight sun’, both of which held Axel’s affection. With some multiphonic effects from the recorder and a feel of narrative development, this is an impressively theatrical and wide-ranging work that nods to Sibelius along the way. The composer sought to “create a dialogue between noisy sounds and small fragments of melodies”, and while there can be no argument about this there is also a great deal of fun to be had along the way … a wonderful snapshot of Nordic contemporary music. Topped by Michala Petri’s virtuosity, no fan of modern music and the crisp transparency of this ‘northern sound’ should hesitate in adding it to their collection. 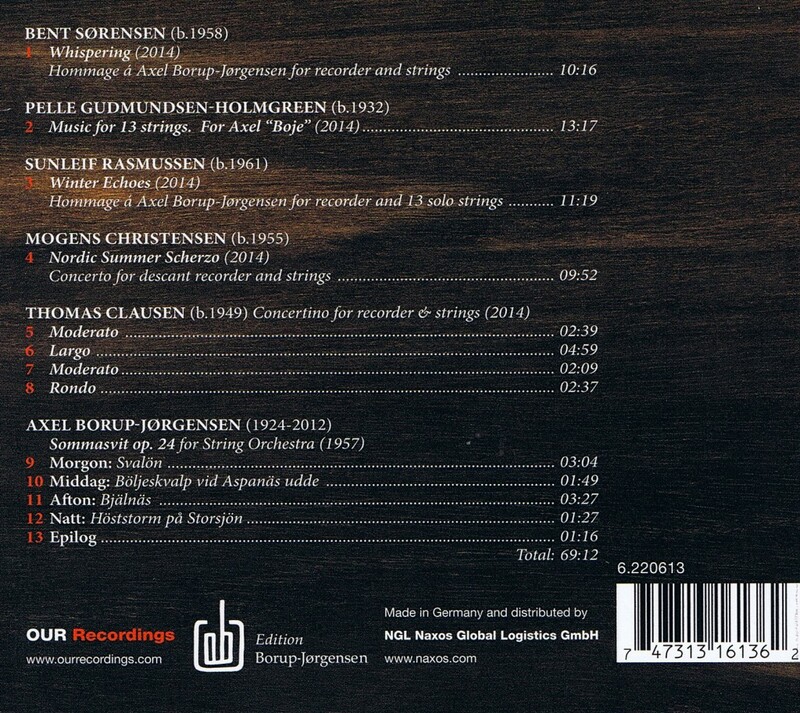 Mogens Christensen’s Nordic Summer Scherzo – Concerto for descant recorder and strings (2014) has a sudden opening with trills from the recorder against lively strings. Petri brings some superb playing to this piece with some terrific string sounds from the Lapland Chamber Orchestra in the various textures, sonorities and harmonies. Soon the recorder develops a tune against a hushed, delicately written string accompaniment before moving through some brilliantly written passages with superb, pin point sharp playing from all. Later a subtle rhythmic pulse appears before rapid strings take the music forward, the opening trills return and the fast recorder theme leads the strings to the coda. In dieser Aufnahme spiegelt sich meines Erachtens eine besondere Qualität der skandinavischen Gegenwartsmusik: ihre erfrischend un-ideologische stilistische Individualität, die Mut zu eigenständigen musikalischen Lösungen hat … Der mit der Blockflöte seit vielen Jahren sehr vertraute Mogens Christensen greift in seinem koloristisch-zwitschernden Nordic Summer Scherzo in seinem Material auf Borup-Jørgensen zurück. This is first-rate music, and first-rate music-making. The always excellent Michala Petri needs no introduction in these pages, and the Lapland Chamber Orchestra plays impeccably under Clemens Schuldt. This recording is recommended for its fine playing and its attractive program. It goes on my Want List. Mogens Christensens Nordic Summer Scherzo skæver til et klaverstykke af Borup-Jørgensen og dennes elskede Sverige, hvis natur han søgte at spejle i sin musik. The Nordic Summer Scherzo by Mogens Christensen is a veritable phantasmagoria of whistling and twittering for both the recorder and strings. It takes the listener to a strange but not unpleasant place. I’m putting this in my “Want List” pile for the end of the year. I hope you give it your consideration. Nænsom brutalitet … Mogens Christensens ”Nordic Summer Scherzo” er trods titlen ikke meget mildere i temperaturen. Hurtigt, jagtende og ustyrligt som kviksølv mellem fingrene.